KDF Soldier Selling Explosives Dramatically Arrested – Kenyatta University TV (KUTV). All Rights Reserved. 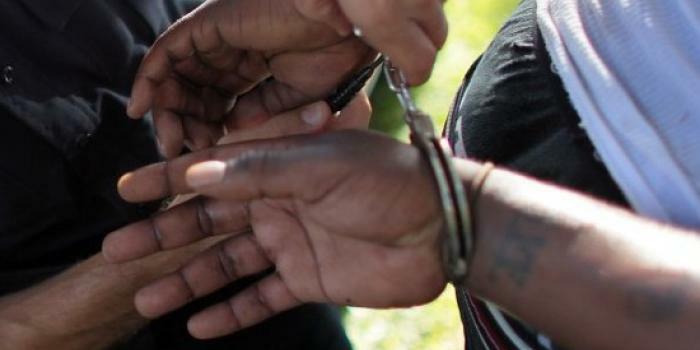 A team of undercover detectives arrested a Kenya Defence Forces (KDF) soldier, a former soldier and three other men suspected to be selling explosives in Lang’ata, Nairobi yesterday. The detectives drawn from the National Intelligence Service (NIS), KWS and Bomb Disposal Unit are said to have posed as buyers, busting the five in Otiende estate. The suspects include Mr Francis Otieno Oluoch based at Kabete Barracks, former soldier Robert Osano, Mr Nathaniel Kiprono, a security guard at Athi River Mining, Mr Johnson Nyarang Omayio and Mr Simon Muturi Gichuki, both residents of Kitengela and Waithaka respectively. During the Sunday night operation, police recovered explosives which were taken for analysis.It is reported that the Kabete-based soldier had left the service but later re-joined as a Constabulary. Police have since launched further investigations to establish the source of the explosives and also arrest other suspects.